Mangoes are quintessential part of summer. And markets are flooded with mangoes. 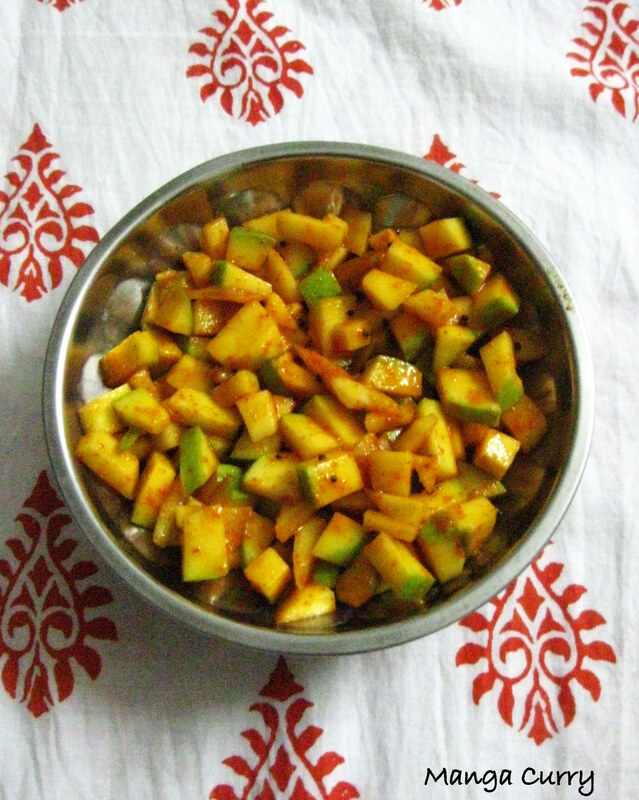 Every summer, there will be Mango pickle, Maa vadu, Instant pickles, simple mango Chammanthi or Chutney, Kootan, Pachadi, Pulisseri, Juices, etc are part and parcel of every house holds in Kerala or for that matter, in India. Today’s recipe is known as Maangai Curry, as it is famously called in Palakkad. They are a family favorite at home. It is simple, easy to prepare and delicious. It perfectly goes well with rice, especially curd rice, and with Dosa as well. Chop the raw mangoes into small pieces. Place it in a bowl. Add the chilli powder, salt and asafoetida. In a seasoning laddle, add coconut oil and once the fumes come, add mustard seeds and allow it to splutter. Pour the tempering over the mangoes. Toss it well. Manga Curry is ready and serve it with rice, curd rice or dosa. Consume the Manga Curry within 2 to 3 days, as it has low shelf life. You can always prepare Manga Curry fresh and as and when needed. For seasoning, you can optionally use fenugreek seeds and sesame oil as well. Preferably Kilimooku manga is perfect for making pickles. I agree, curd rice and Manga curry tastes just delicious 🙂 Thank you! Isn’t this the instant manga curry they make for weddings! I love it. Appreciate for sharing your thoughts 🙂 Yes this mango pickle recipe is doable and delicious as well. Thank you visiting my blog and liking 🙂 Stay connected..
Looks amazing, I am so into Indian food but never really get too adventurous as I don’t what what I am doing! Will definitely be trying out some of these recipes! Also thanks for visiting and liking my blog! Thank you so much Sophie 🙂 Appreciate for sharing your thoughts and visiting my blog! Stay connected for more Indian food in this space. Mouth watering 🙂 Thanks for the recipe.